Neon is a trend that's still going strong. If it's important that your life have more of it, consider printing your own neon DIY stationery set with this downloadable freebie. April is National Card and Letter Writing month, so let's send some mail! I've designed notepaper and a matching envelope in two patterns: scallops and stripes. They turned out a bit Kate Spade-y, no? You can mix them or match them. 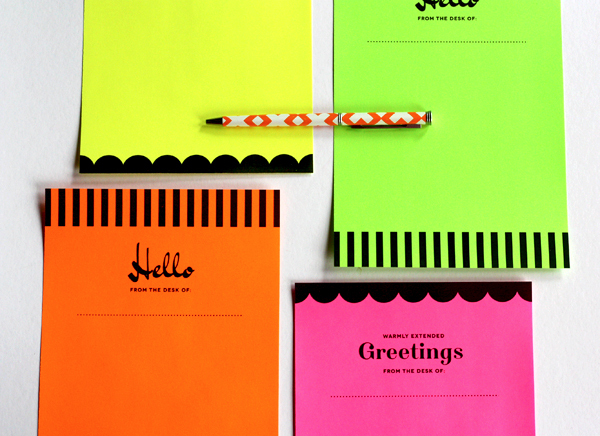 I printed the designs on sheets from a pack of Astrobright Neon paper I bought at Office Max. It's a common brand available at most office stores. But if neon scalds your eyeballs or reminds you too painfully of junior high, use any paper you like. Brown kraft paper would be cool, too. Download the free, printable PDF right here. The document has four pages; print out the pages you need at 100%. 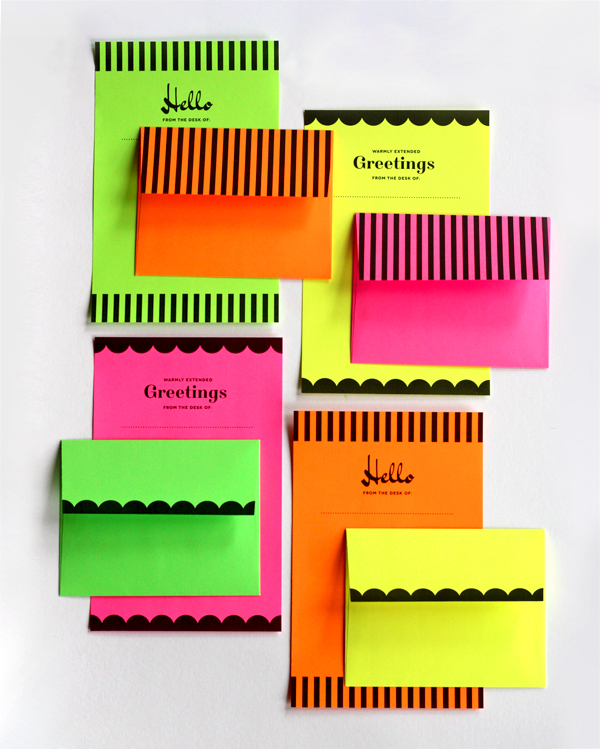 Trim out the notepaper sheets. Cut out the envelope templates, score along the fold lines, and fold the flaps inward. Secure them with a glue stick. Mail a note to a buddy. Or print up sets of these, tie them with black ribbon or neon twine (I spotted some at Paper Source the other day) and give them as small gifts or party favors. Wow, I wonder how long it's been since I wrote an actual letter. 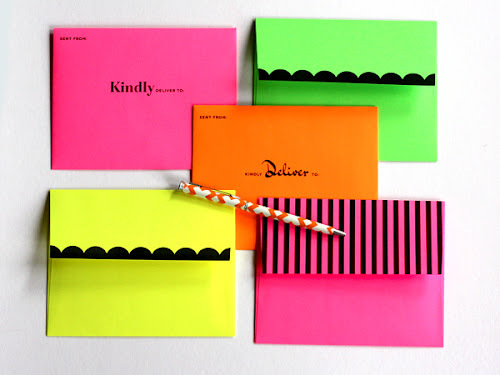 This cool stationery would encourage me to do it! Hmm... I wonder to whom I should write?! Thanks for the pretty designs! At least you don't have to write much, since I made the actual text area pretty small. It's much less intimidating to those of use who only want to write three sentences. Aha! Very good idea! Haha! 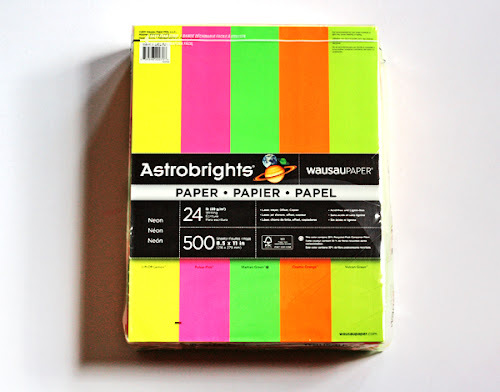 OMG, I love the neon paper! It was a special treat when I was younger to get a pack of this to add to my drawing paper stash. These are fantastic! I love them!!! Especially on the neon! I miss receiving letters by post. Hmm... I'm not sure, since it's working for me. Are you saving the PDF to your computer, and then opening it in Adobe Reader to print it? Wow! What a great idea! Thanks! Yes, totally thought of junior high class projects!! So fun and cute! Thank you! These are adorable. Can't wait to print them up for my daughter!